Breakfast foods include cereals, toast, fruit, pop tarts, breakfast bars, hot foods (bacon and eggs, pancakes), coffee, juice, milk, energy drinks, and so on. This is a competitive market where consumers will either eat breakfast at home, on-the-run (that is, while traveling), or at a coffee shop, diner, or at a fast food outlet or even acquire food through a vending machine. 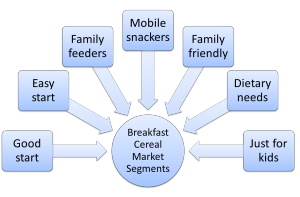 As you can see, the breakfast food market, if broadly defined, consists of array of direct and indirect competitors all trying to meet a similar consumer need. This market situation highlights the need for effective market segmentation and differentiating between different consumers and their underlying needs and motivations. This market segment considers breakfast to be an important start to the day and these consumers typically look for healthier options. They rarely skip breakfast and tend to eat at home. As consumers, they are typically quite organized and planned and would generally have a good array of healthy food in their house at all times. They would be more highly-involved purchasers in-store and are more likely to be attracted by in-store demonstrations and probably rely upon packaging and nutritional information. They are generally less price sensitive as they understand that you need to pay more for healthy quality food. They would be attracted to brands that specialize in higher quality and nutritional products. The easy start market segment is looking for quick and convenient solutions to breakfast. This would include purchasing breakfast outside of the home using a takeaway option, or pre-purchasing cereals, breakfast bars, or pop tarts that require very little preparation. These consumers are often less planned and organized, as opposed as to the good start market segment, which means that they are more likely to engage impulse purchases – making them a good market for sales promotions and special offers. This will mean that they are generally brand switchers, as they are looking for quick simple solutions. These this segment consists of families who have a larger number of children, or several teenage children. They perceive breakfast as a necessary, but potentially low-cost, meal of the day. They are highly unlikely to purchase breakfast out-of-home, as this would be quite costly for a large family. Instead they attracted to low-priced basic cereals and breads and pancakes, which the family can consume in large quantities without a significant cost concern. This does not mean that they are budget conscious for all meals of the day, but do see breakfast as a cheaper part of the day. In terms of marketing activities, discounts and in-store displays would be quite effective promotional tactics. And due to the fact that the main grocery buyer is purchasing on behalf the family, flavor varieties of established brands would also be attractive. 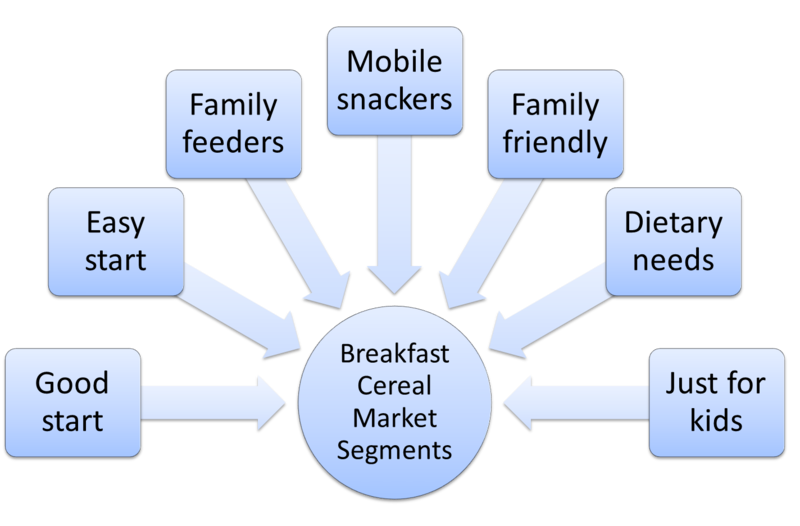 Mobile snackers, as suggested by the segment name, are consumers who eat breakfast out-of-home. They are more likely to purchase food at a cafe, diner or a fast food outlet. Alternatively, they may pre-purchase a breakfast bar, fruit, breakfast drink, or some form of energy drink. They typically have either busy or unorganized lives and will often rush off to work or study and just grab some food or drink along the way. These consumers have an underlying need for convenience and products that are easy to consume (and not messy) while traveling. Therefore, they are less price sensitive, but probably more brand loyal to their convenient solutions. This is another family market segment, but it differs from family feeders as their emphasis is NOT on a low-cost product solution. Instead, the main grocery buyer seeks to purchase products that would be generally acceptable for all members of the family. In other words, they do not tend to buy a different product solution for each member of the family, but seek out “middle-of-the-road” breakfast solutions that everybody will eat. As a result, this market segment is more likely to eat at home with established cereal brands, as well as incorporating hot food options such as pancakes and toast. They tend to be more brand loyal, relying upon brands and products that are acceptable and known to their family members. This market segment has a diverse range of needs, but can be clustered together because they are purchasing breakfast foods for specific health or dietary reasons. This is a growing market segment as more consumers become aware of certain health issues, such as gluten-free, low carb, nut free, and so on. Therefore, this market segment differs from the good start segment where there emphasis of is upon general health and well-being; this group of consumers have more strict requirements for their diet and perhaps medical advice to follow. This will mean that this particular market segment is highly attracted to specialized dietary brands and products, they are highly involved in the purchase decision, are highly brand loyal, and are very unresponsive to sales promotions and special offers outside the brands they know and trust. Price is a very minor factor in their purchase decision. This market segment views the breakfast meal as primarily targeted at children. It is likely that the parents in this family unit may only consume coffee or juice for breakfast. Is as a result, this segment are heavy users of children cereal. They would be attracted to sales promotions for cereals designed for children, including licensed brands (such as, using Disney characters).